This is an online action RPG developed by former employees of Capcom, Blizzard, Riot Games and BioWare using Unreal Engine 4. 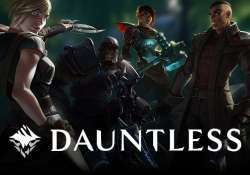 The story of Dauntless takes place in the world of Shattered Isles. Due to an unexplained cataclysm, an Earth-like planet is destroyed, its continents are torn apart and their fragments float upwards. What’s more, those who are still alive must face Behemoths – dangerous creatures that keep becoming more and more aggressive, posing an ever-growing threat. The only hope for the survivors are warriors who hunt those beasts. It's designed with cooperation in mind. There are many tasks to perform, but they all come down to fighting. Behemoths are giant and intelligent creatures, so mindless attacks will lead to a quick death. Before challenging them, players must learn the move set of the hunted beast, find its weak points and use that knowledge properly. It is important to not waste time, as enemies become faster, stronger and more aggressive the longer a fight takes. Fortunately, players' character is a well-trained warrior and can use different fighting styles, depending on the wielded weapon. A great hammer, for example, deals huge damage, but is slow, while sword is relatively light and better for long combos; however, the damage dealt by a single hit will be greatly reduced, compared to big, two-handed weapons. One should also remember about stamina, used both for attacking and dodging. While all of it is arcade, the game requires from players some preparation, patience, good timing and knowledge about each weapon and skill. Like every respectable RPG title, it features a development system, here in form of archonite: a type of energy that drops from defeated enemies. It is used to upgrade armors and weapons, as if sealing beasts’ powers in them. It works quite simple – the stronger the beast, the greater the benefits that players get. The game doesn't aim for realism, with characters looking like they come from comics' pages and screen filled with pastel colors.